So I knew that putting in a water element, pond, falls, wasn’t going to be as easy as say digging a hole and filling with water and, Ta Da! a pond! But this is taking more thought than I had anticipated. After we dug the initial hole, and kind of got a feel for the size, depth, and the direction on the water fall, we started to talk about rocks. I love rocks, my kids love rocks, rocks seem like a no brainer to me, but they aren’t, they are super duper important, and choosing carefully is apparently the name of the game! Water hitting, cascading, dribbling, rolling over rocks creates different tones, pitches, and sounds. Flat rocks, round rocks, odd shape rocks with pockets, sheesh… I wasn’t thinking water symphony when I had my pond idea, but I do like the ‘right’ sound of cascading water, not that ‘pitchy’ sound. Do you know what I mean? So we’ve been sitting on it a bit, watching videos, talking to Aqua Experts that have been super helpful (and by the way, I am so becoming an Aqua Expert in my next life, they have an awesome job), and visiting rock yards. We decided to dig the hole deeper on one end, and this was a bit tricky as we ran into hard clay. We expanded the sides by 3 inches, and we bought a smaller pump to start with (1200 gallons an hour). 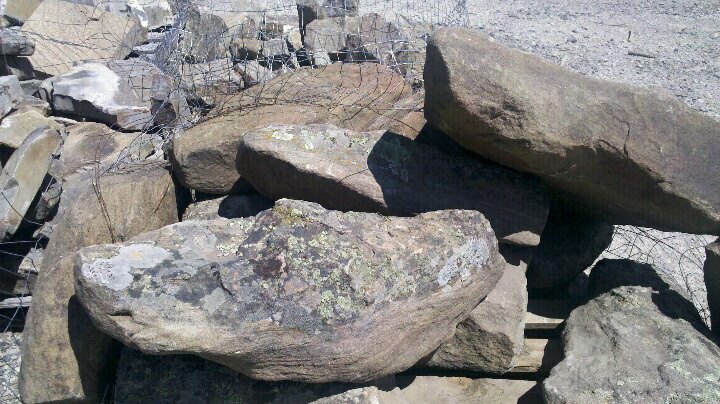 And now we have our rock supplies, which we finalized today, and hopefully didn’t drive the guys at the brick/rock yard too crazy. They were so helpful, and helped finalize our choices. Like everything, this little project just got a bit bigger, and a bit more complicated. Good weather, wine, garden food, and helpful helpers are keeping it fun! Just a thought…if you’ve got a truck and access to a National Forest, you can get a permit to rock gather. I believe there is a limit on size or weight for a non-commercial permit, but if feasible for you it might be worth checking out. I can’t wait to see the finished product! Nice post keep up the good work! It will be worth all your effort when completed. I have to stick with a bird bath for now while I have the pets as I will have every critter know to man come from the river and woods here to check it out and to drink from 🙂 I can imagine the photography I would capture but I will leave that for years down the road 🙂 I have saved to old bathtubs with feet I had been planning to use until my Mom had to fish out the animals that could not swim in hers so I will sit back and enjoy YOURS!